At long last the property I saw and bought in less than 3 hours and refurbished in just 18 days has sold! This afternoon the solicitors have done their various bits of important paper-shuffling and DX mailbox malarky and contracts have exchanged! So, this epic saga is now drawing to a close. And I know this “adventure” seems to have dragged on for far longer than what anybody ever thought it would do, or should do. But, in all honesty, I guess this whole story kind of encapsulates what it is REALLY like when you buy, refurbish and sell a property. I know there have been many of you who doubted whether this sale would actually happen – and I too have also wondered at times, whether a sale would happen or if it would end up with me renting the property instead. And also rejoice in the fact that I have proven estate agents do NOT have magical powers when it comes to selling property! The battle of the estate agents: online estate agents Vs. High Street estate agents has been fought and Hatched the online estate agent have won several times over – not least because they have now sold my property, but also because they sold it the time before that as well! And let us not forget the sort of escapades Hatched have had to put up with: who will ever forget the Hungarian Adventure in Tesco’s Cafe!! And all of this wonderfulness which Hatched tirelessly sought to achieve, kind of makes me feel a bit guilty. Because I do have a *little* secret to share…. There were times when I doubted the Hatched process. Given the pittance I was paying them to sell my property, I couldn’t help but think to myself on occasion “This is too good to be true…” and we all know how that sentence ends. And so I have always felt a little hesitant that once the process got more involved, and a bit more like proper estate agency work and less like advertising on Rightmove, that maybe, just maybe, the whole process could potentially fall apart. And I have to admit, hand on heart – that is where Hatched really came into their own. Surprisingly so. 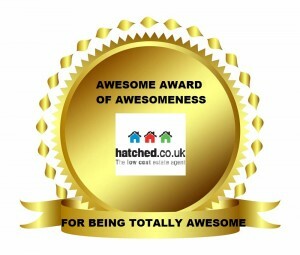 And they are PROPER estate agents: they just happen to be online! At times I have even felt positively over-whelmed by the amount of update emails and phone calls from Olivia & Joe at Hatched. At every step of the way they knew what was happening and they made sure I knew what was happening. And to cap it all off, not only was the service top notch – but selling my house with Hatched cost just £477.60 – a whopping saving of £3266.40 against the high street estate agent. For that I believe Hatched deserve an AWESOME award! How To Design The Cover Of A (Hoped-To-Be) Best Selling Property Book? Sam, in the battle of the estate agents vs. online agents I can categorically say that online estate agents win the game hands down and by a significantly wide margin. I recently let out my 2 bed flat for £139 with urban sales & lettings. A saving of over £1,070 a year. And this included tenant referencing with a leading credit rating agency and a premium web site listing. I had no less than nine viewings over a period of 6 weeks (including your usual DSS suspects!) but in the end settled for a young professional couple. Most striking of all was the exceptional customer service. I even received responses on the weekend and a complimentary marketing assessment. Now, I am not forecasting the demise of the High Street estate agents per se, but they certainly need to up their game to catch up with the NKOTB. Rich – Great news you have also benefited and saved such a big sum of money by going with an online agent. It’s interesting you mention about the “exceptional customer service” – I am SO with you on that. I have been blown away by the personal service, I don’t know why I expected so much less service – esp. given we’ve all got used to Amazon (and their exceptional customer service), but somehow I expected less by going to an online agent! Thanks Stuart. I will get the final sums together in the next few days and hopefully should had that all ready by next Friday which is when we complete. That way we can all see if it actually made any money!